Bliss Blakeney is a striking piece of contemporary architecture sitting in 16 acres of the North Norfolk coast with direct views across the salt marshes, Blakeney Harbour and the North Sea beyond. It’s low profile, cross laminated timber construction designed by architects Waugh Thistleton, nestles into the landscape really beautifully, however nothing quite prepares you for what happens on the inside of this home and our contribution to it. All the projects we make are collaborative but Bliss Blakeney was an especially creative brief and working relationship throughout. Right from the initial discussions it was clear this was going to be an exciting project, the kind of thing as furniture designers we dream of; full of colour, texture, new materials and innovative design solutions. Key areas we were asked to look at were the kitchen, living area furniture and panelling (snug), stair wall panelling, library shelves, and bar area. In this first Bliss case study we are going to concentrate on that downstairs open-plan living / dining / kitchen space with a particular focus on the kitchen. The other parts of the interior are covered in part 2 of this blog which you can read by clicking here. By the time we were engaged on the project the building works were finished and the clients were living in the house with a makeshift kitchen. The space is large and partly glazed on the two long sides with sliding full height doors allowing lots of light in. Despite this there is little direct sunlight as it is built on an east-west axis with shaded overhangs. The views out of these large panoramic windows offer big skies and vistas to the North Sea horizon. 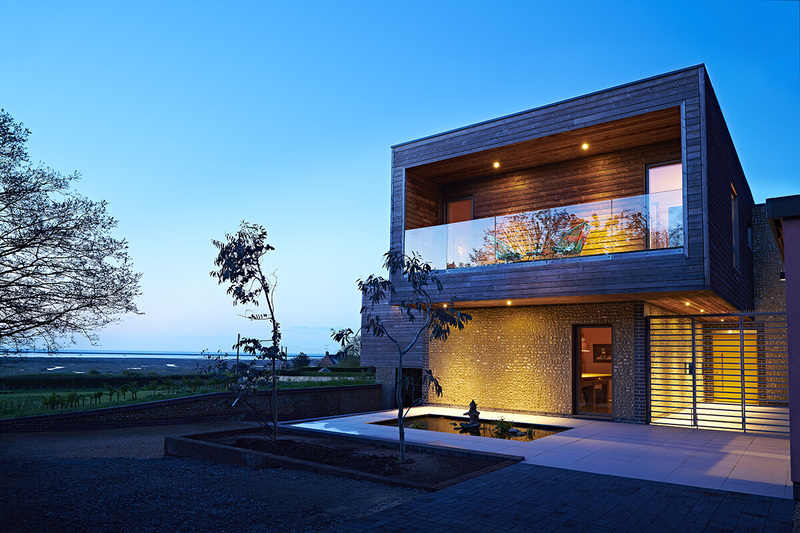 These views can be glimpsed from all over the house though openings that embrace the land and seascape around it. The floor is a warm grey smooth cast resin, but that was the only ‘finished’ element. At the time many of the walls and ceiling were still the raw CLT (cross laminated timber) softwood panels. Although much of this would be either painted or covered with our bespoke panelling, plenty of CLT would remain exposed, highlighting the character, fabric and craft of the building. The palette and our brief were very open, but through our continuing conversations with Daniel & Lisa we narrowed that down to a bold set of materials, textures and colours. The kitchen was going to have a modern industrial feel softened with contemporary timber tones. 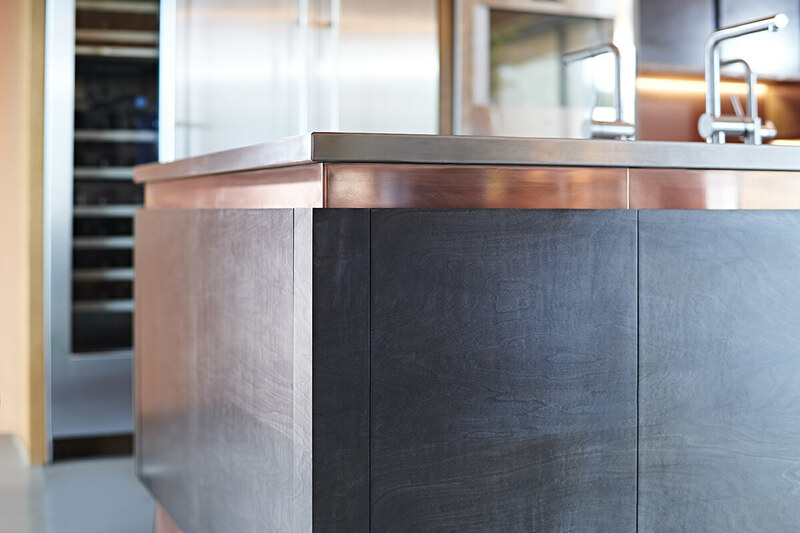 After lots of ideas and sample boards what eventually took shape was a stainless steel worktop on the island with copper sheet inset handle detail strips and plinths. A copper worktop and rolled upstand/back panel would also feature in the oven wall. The timbers were a combination of a dark charcoal grey figured sycamore and fumed solid oak. Over many years of designing and making kitchens we have developed a reputation for beautiful curved flowing kitchen spaces, often in walnut, elm or something similarly rich and woody. (Click here to see our other case studies). Don’t get me wrong, we love that kind of work, but sometimes you just crave the opportunity to do something different and this was going to be it; a straight-lined, sophisticated industrial but warm kitchen space. It would be a portfolio game-changer for us. Layout was to be simple – a very large island, 4.1m long x 1.4m wide sitting in front of an oven, refrigeration and storage unit wall. 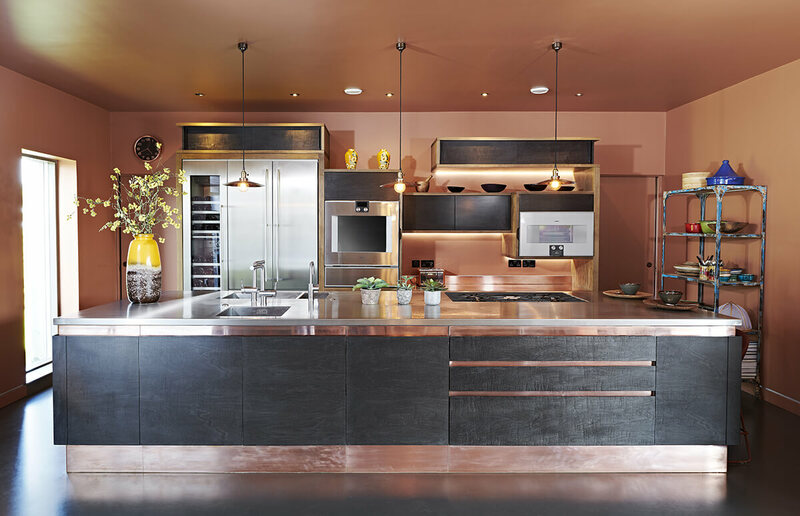 That wall was full of copper lit recessed alcoves, cupboards with sliding doors, big drawers, open shelves and the stainless steel and glass of the Gaggeneau appliances. The island top contains the gas hob and two sinks (one on each long side of the island) in the singularly impressive stainless work surface. This bespoke work was done by a local Norwich company called SAMS Fabrications who did a great job of wrapping the 40mm island top and seemlessly welding in the hob and sink. They also cut and folded all the copper work which is seen directly below the stainless top in a recess that runs around the whole island. It also runs around the plinth. The third material – a warm charcoal grey figured sycamore on the doors and drawers really brings the three way combination alive. In some lights it looks black, but on closer inspection it is full of life and shimmers with movement and depth. The island fulfils many functions: The long side facing the ovens is the working galley space with pan drawers, under sink storage (which also contains the Zip boiling / chilled water tap equipment), the hob and a dishwasher. It has plenty of surface prep space and the double sink. The opposite long edge which faces out into the living / dining area supports that social role, with cupboards and doors to store cutlery, crockery and serving dishes as well as a second dishwasher and sink. This means lots of the parafanelia associated with dining, drinking and socialising never needs to go to the other ‘working’ side of the island. The short ends are fully utilised as well, with one end being an impromptu 2 seat breakfast bar with shallow drawer above, the other having a pair generous pull-out waste bins. 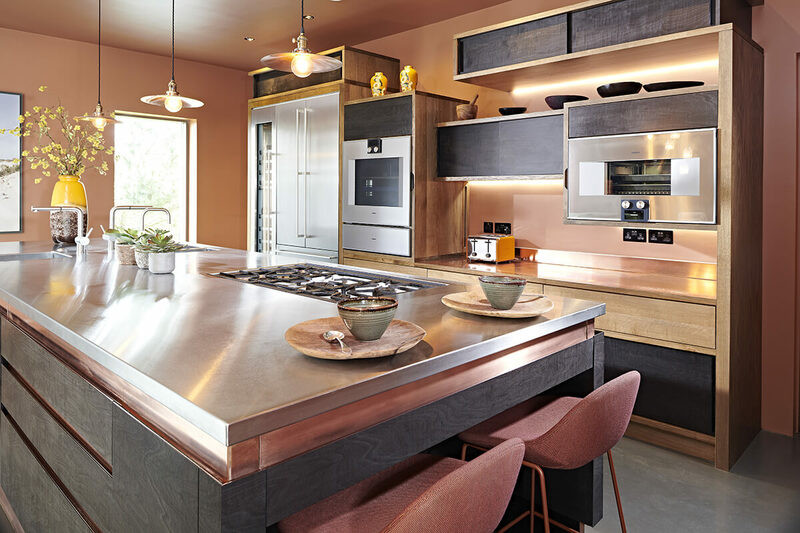 The island acts both as a barrier to separate the kitchen working area from the social space and as a striking visual feature – a foil to the more playful oven wall units behind. The back wall carries the ‘big’ appliances – the two 900mm wide Gaggeneau ovens plus warming drawer, a generous fridge freezer and a tall narrow wine fridge. 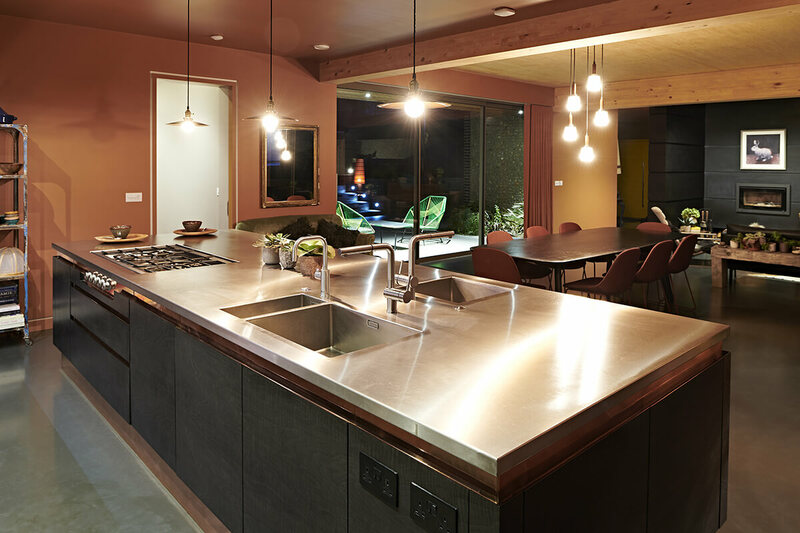 The cupboards, shelves, recesses and drawers around those appliances form a rather abstract assembly in contrast to the simple functionality of the island. Lighting plays a key part here, creating depth, reflection, colour and shadow. I wanted it to be more like a piece of abstract sculpture than your usual run of full height wall units containing the appliances. 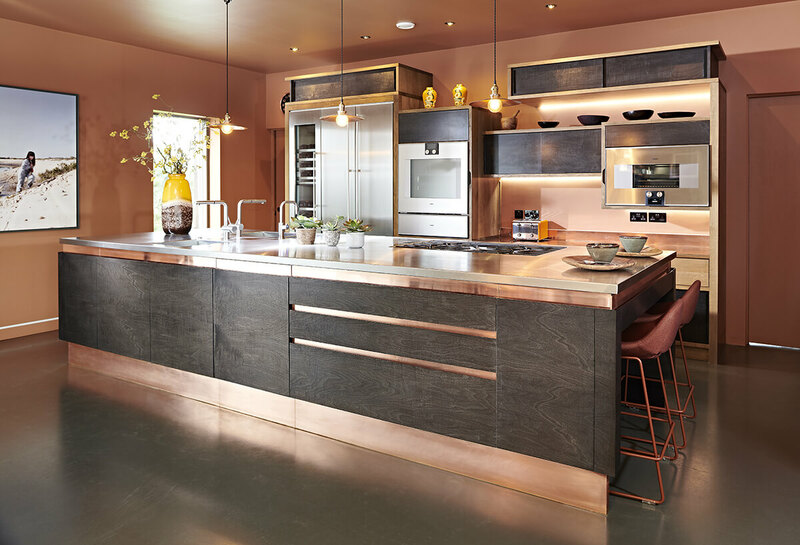 It certainly achieves that, with horizontal ‘landscape’ cupboards in fumed oak and charcoal figured sycamore appearing to float against the back lit copper glow. The openings allow featured objects to come to life and even the glass fronts of the ovens and wine fridge reflect light beautifully, creating yet another surface which changes in the constantly altering light conditions. The back wall units do not fill the space to the ceiling, nor do they run to the corners of the room – on both sides there are sliding doorways into utility and pantry spaces so the ‘wall’ becomes much more akin a piece of contemporary furniture than kitchen units. The whole of the downstairs space is open and very sociable, a reflection of the client’s lifestyle and characters. It’s a family home, an entertaining space for lots of people yet it manages to have an intimacy in areas like the snug. That’s down to a combination of good design and the light touch of Lisa & Daniel’s well chosen interior objects – from the furniture to the artwork. 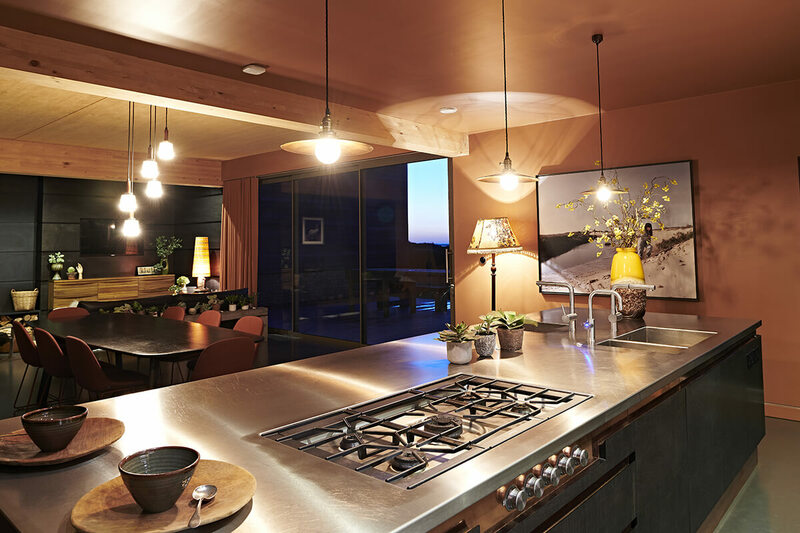 The kitchen consciously plays with the clients love of contemporary art work, eclectic interior styling and their piece of contemporary architecture’s place within the big landscape. It is very much a kitchen designed for them and with them, and the way they live on this extraordinary patch of the North Norfolk coast. Read about the other interior work we made for the Bliss project in part 2 of the case study.